The new terminal will drive cruise tourism in coming years to boost the island’s economy and also create steady jobs for the local population during its construction. Construction is set to begin in November. Photo by Andrew Patrick. Royal Caribbean Cruise Line is partnering with Barbados to build a brand new state-of-the-art cruise terminal on the island that will cost over $300 million. The new facility will accommodate some of the world’s largest cruise ships. George Hutson, Barbados Minister of International Transport and International Business, announced the two year project. “If we are going to remain relevant, if we are going to capitalize on the opportunities available from cruise tourism, we must renew our plant from the basic infrastructure currently existing to one which will accommodate and service the increasingly large cruise ships,” he said. According to Hutson, Barbados is hoping the new cruise terminal will attract more cruise ships to the island, which in turn will lead to increasing revenue generated by cruise passengers on the island. The new terminal will be completed in two phases; the first phase will cost $300 million and will include two cruise piers, arrival and departure facilities, along with parking lots. The development will involve reclaiming 15 acres of land from the sea, 100,000 square feet of which will be provided for commercial activity. Dredging is slated to begin in November. 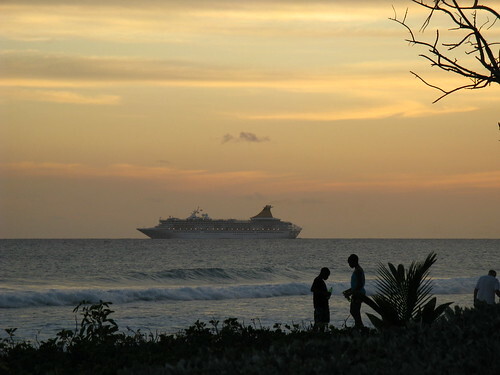 Cruise tourism in Barbados has grown from 127,000 in 1985 to 726,543 last year. The best year ever for cruise passenger traffic to the island was 2004 when 812,863 people visited the island.